3, capacitors 1000 uf 35 volt electrolytic. C2 and C3 have to be large enough to pulse the E unit,this varies with relay coils used but this value should provide about a 1 second duration. 5, 1n4001 diodes or suitable substitutes. A separate transformer is used to power relays and timer. Most any train transformer. It can not share a common with the track transformer. The minus of the bridge rectifier shares a common with the track transformer drawn here as "U"
"A" goes to the center rail power through the NC contacts of relay 3. So power is on the track unless relay 3 is energized. The relay transformer set at 18 volts AC is in series with a bridge rectifier. Filter capacitor C1 boost voltage to 24VDC for timer and relay coil power. The red wire + 24VDC goes to goes to the 3 relay coils and to the +s of C2 and C3 in series with a small value resistor. IR1 and IR2 are insulated outside rails. They are connected together. Train wheels complete the circuit and immediately energize relay 1 providing - DC to Coil 1 and - DC power to coil 2 after the delayed set time of the Mars timer module. When relay 1 or relay 2 is energized Their respective capacitor,C2 or C3 is discharged into relay coil 3,momentarily energizing it. Diodes D1,D2 keep capacitors separated. Not shown for clarity,diodes are placed across all 3 relay coils opposing flow for spike suppression. The system is started when the train is in the center area,moving one way or the other. Then the power is turned on to the relay system. 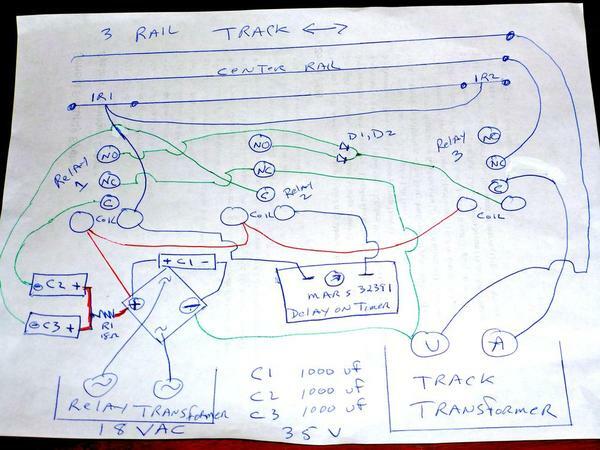 When the train crosses IR1 for example at the end on the line,relay 1 is energized and C2 is discharged into coil 3. Relay 3 contacts momentarily break the power to the center rail. The e unit is cycled into neutral. When the timer times out. Relay 2 is energized and C3 is discharged into coil 3. The track power is again momentarily interrupted the e unit cycles into its opposite state. the train moves in the other direction. It vacates IR1,the timer is reset and the capacitors are charged,the process is repeated when the train arrives at IR2,it reverses back. The process will continue until power is removed. then the whole thing will have to be started again,cycling the e unit once with the transformer in the conventional manner. I would add an additional relay as an emergency shut off at the ends,but I am trying to show the basic idea. Additional relays can be added for soft start,stop and block signal logic. Parts would cost maybe $40 for this basic circuit. mars timer modules are inexpensive and durable. Coupled with relays ,most timing functions can be done in model railroading. Further applications for the timer are in the electrical section here.